Horsetail restio (Elegia capensis): growing, planting, caring. 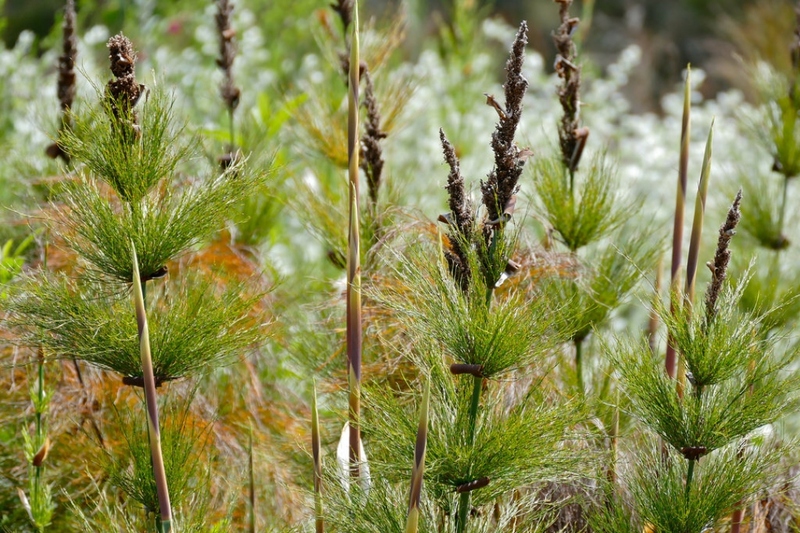 The horsetail restio is a tall, dark green, elegant plant with large, decorative, papery sheaths along the stems. It is a ideal next to a pond. The stems of the horsetail restio grow from underground rhizomes, are quite thick, divided into sections (internodes) like bamboo plants and can reach 3 m tall. At each node there is a circle of clumps of long, needle-like branches, which give the plant its horsetail-like appearance, and name. Ideally plant near a pond or water stream : this plant requires a sandy but fairly moist soil. A plant usually found near water streams in its natural habitat, the horsetail restio requires a moist soil. If the branches are small, it surely is a sign of lack of water! Water up to once a week in dry season, and less for the rest of the year. Note: if the branches take a yellow hue, it is a lack of nitrogen: a little supply will not hurt! Each year new stems will grow - after 3 years they age : cut off the oldest ones from the bottom.